3. Who decides the patch to be accepted or not? 4. What kind of patch will be rejected? Initial Release: January 8, 2014. Amendment #1: January 15, 2014. Amendment #2: January 21, 2019. 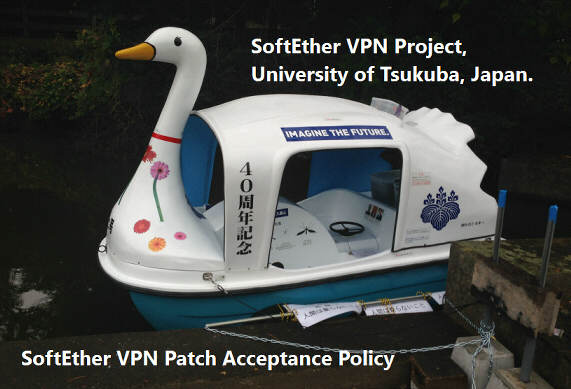 This policy defines our patch acceptance policy from contributors for SoftEther VPN. Sending a patch to us is very welcome and appreciated. If you would like to send a patch for SoftEther VPN, please use the GitHub pull request function. We are afraid that we cannot accept patches by other methods, in order to keep the consistency of the source-code tree. Who decides the patch to be accepted or not? The SoftEther VPN Project has the authority to decide whether or not to accept the received patch into the SoftEther VPN source code tree. We do not guarantee that any patch will be accepted by us. What kind of patch will be rejected? We would like to accept any patches. However, we have the right to reject any patch by our discretion. A patch which contains bugs or other issues. A patch which degrades the quality or the functionality of SoftEther VPN. A patch which obviously has a copyright violation to any third person. Please note that if your patch is rejected by us, you can publish it on your own forked project of SoftEther VPN, because SoftEther VPN is an Apache License 2.0 open-source project. All computer programs are copyrighted, including your patch for SoftEther VPN. When you intentionally send a patch to us by the GitHub pull request function, we regard that you permitted to merge it into our SoftEther VPN source-code tree. Since the entire SoftEther VPN source code is licensed under the GPLv2 license, your patch will be also treated to adopt the GPLv2 license. As the consequence, anyone will be permitted to copy, modify or re-use your patch program under the GPLv2 license. After your patch will be commited on the source-code tree, as a token of our gratitude, your GitHub username may be added on the AUTHORS.TXT file and on the header of the related source file. Please kindly append your name by yourself editing the text file.